LinkedIn provides a great platform for running advertising campaigns. What separates LinkedIn from Facebook and Twitter is it’s unique ability to target the audience through their professional identity. LinkedIn provides remarkable benefits to Business to Business marketers as Recruiters can reach out to the professionals with desired skill set and knowledge. Also, recruiters can fetch up-to-date professional information of all the individuals which they cannot get on any other social networking site. Marketers target ads to users by important B2B demographics such as job title or industry or even focusing on members of particular LinkedIn groups. Campaign Name: Create a name for your campaign. Try naming the campaign in such a way that you can recognize the goal of the campaign seeing the name. Ad Language: Select the language for your ad. Media Type: Select either a basic advertisement that follows the traditional format, or a video ad that includes a play button on the image. Ad Design: headline and description is created here. The headline has a 25-character limit, and the description cannot exceed 75 characters (2 lines). Ad Variations: You can create multiple variations of ads. 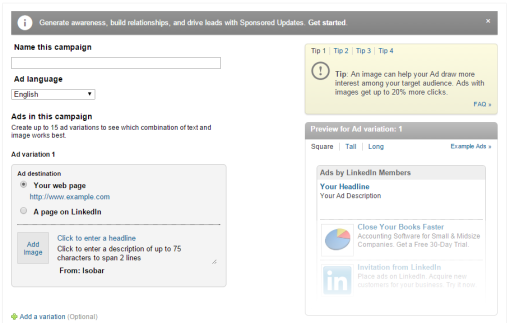 For each ad, you can choose either an external URL or a page on LinkedIn. Once an Ad is created , then comes the task of reaching out to the potential clients. This is done by carefully setting the targeting criteria. LinkedIn provides lots of options for targeting the users which differs from Facebook and Twitter. It can be said that this is where LinkedIn is better than Facebook and Twitter. The targeting options like Job Title , Employer , Industry or Skills /Interest helps in reaching out to the desired audience. Location: Here we specify the location of the audience whom we want to target.We can select World regions , Countries , States and Metropolitan Areas. We can target users by either company name or by a combination of industry and size. We can also target the users of specific company by mentioning the company name. Suppose if there is a Ad that we want to direct to employees of Flipkart.com , so we can specify the company name in target criteria. Also, we can target categories of companies by selecting industries and the number of employees. For example, we can target Online Media companies with company size as 51-200 employees. Users can be targeted by their job title, we can enter the specific job title. Users can also be targeted by the combination of job function and seniority. Suppose , if we want to target the professionals from Advertising Industry who are working at Manager level or a Media Consultant . So we can select relevant job titles. 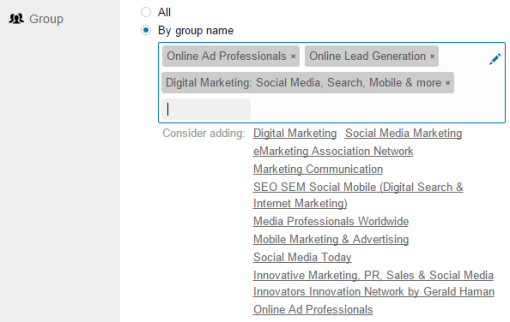 LinkedIn will automatically show some related titles which you can also choose. We can also target users by specifying the job function and seniority. 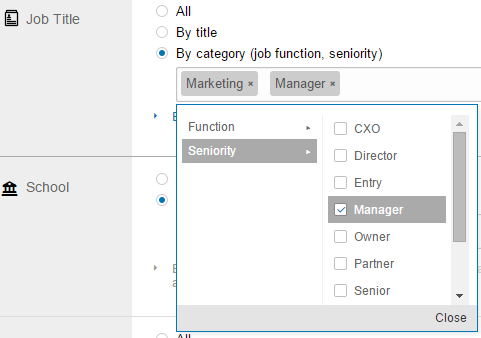 Suppose we can target users by entering job function as “Marketing” and Seniority as “Manager”. 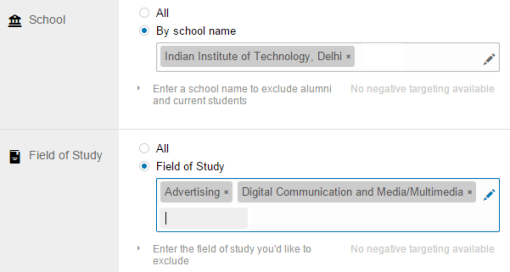 Users can be targeted by entering the specific school or university name. Suppose if we want to reach to people who have attended IIT Delhi , we can mention “IIT-Delhi”. We can also specify the Field of Study for refining the search. For example , we can target users studying Advertising , Digital Communications. Users can be targeted on the basis of their specific skills set. Suppose , we’re trying to reach online advertisers, we can enter “PPC,” “Online Advertising” and “Google AdWords” as skills. Users can be reached by mentioning the name of the group they could be part of. Suppose , we want to target people involved in Online Advertising , we can reach them by the selecting relevant groups available on LinkedIn. Here , we selected groups like Online Ad Professionals , Online Lead Generation. CPC (Cost-per-click ) – minimum of $2 CPC. Daily Budget is the maximum amount someone is willing to spend each day. 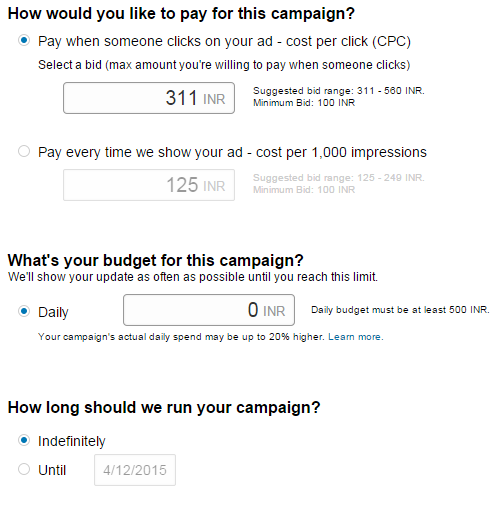 LinkedIn has a minimum daily budget of $10. Daily budget is spent based on how active the users are on LinkedIn. 50% of the daily budget is usually spend in the morning , rest 50% is divided in afternoon and night. We also specify for how long we would like the campaign to run. Either we can put the specific dates or select Indefinitely option. 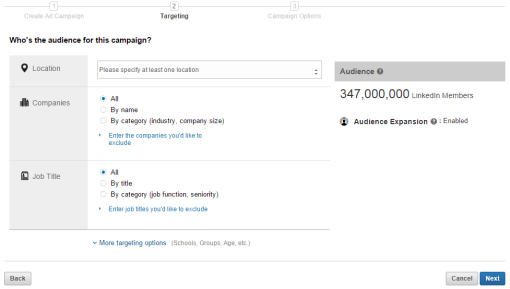 Once the Ad is ready with all the information , desired targeting criteria it can be submitted by clicking on the “Launch Campaign” button.